Trying to find the best resort when you are in South-East Asia? Look no further than the Resorts World Sentosa on Sentosa island in Singapore. 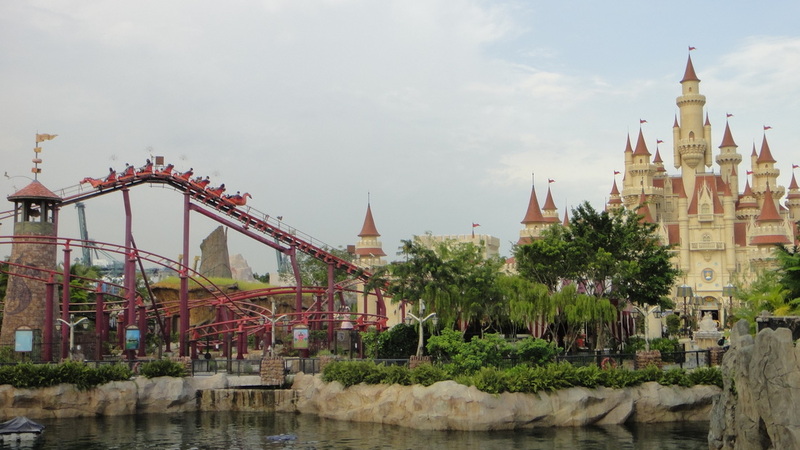 There you will find Universal Studios Singapore.Universal Studios Singapore is Singapore’s first and only Theme park. In 2005 a law was passed in Singapore un-banning amusement parks and casinos in Singapore. This gave Universal Studios a great opportunity to market more people. Construction of the park began on April 17, 2007. The park had a soft opening on March 18, 2010 but the grand opening was on March 18, 2011. Universal Studios Singapore is very unique in the way it is built. The park has 5 areas Hollywood, New York, Sci-Fi City, The lost World and Far Far away.The park boasts 5 roller coasters. The one roller coaster that will have thrill seekers coming on again and again is Battlestar Galactica: Human vs. Cylon based on the Battlestar Galactica tv series. Battlestar Galactica is an exclusive ride to Universal Studios Singapore. Another Unique ride is Jurassic Park Rapids Adventure. This Jurassic park ride stands out against all of the others because this one a a river rapids ride unlike the traditional Jurassic park rides this one is not a Shoot the Chute type ride. Currently the a new family ride in Far Far Away called Kung Fu Panda is under construction in the Far Far Away area of the park. There are a variety of shows at the park but the biggest one is Waterworld: A Live Sea War Spectacular. In October 2011 Halloween Horror Nights the park’s Halloween event began. Shrek 4-D and Donkey Live are two shows that play at the Far Far Away area of the park. The show “Lights! Camera! Action! Hosted by Steven Spielberg” is a show exclusive to Universal Studios Singapore as well. A live fireworks show called Lake Hollywood Spectacular only operates on Friday and Saturday. Universal Parks & Resorts markets the park as a "one-of-its-kind theme park in Asia" and promises that the park will be the only one of its kind in Southeast Asia for the next 30 years.